Submission of the Bylaws Committee’s recommended amendments to the NJSBA Delegate Assembly in May 2019. Nominating Committee Elections: Article X, Section 3 of the NJSBA Bylaws requires that the Nominating Committee be established prior to the May Delegates Meeting. In accordance with Bylaws Article X, Section 3, four members of the Board of Directors were elected to serve on the 2019-20 Nominating Committee. This election took place on Friday, Sept.14, 2018. On Saturday, Sept. 22, 2018 the County Association Leadership (CAL) elected its four representatives to the Nominating Committee. In accordance with Bylaws Article X, Section 3, a (3), four at-large members of the Nominating Committee were appointed by the president, with the advice and consent of the Board of Directors. • The Non-College-Bound Learner Task Force rolled out its report on Oct. 2 and again at Workshop 2018, which featured a video presentation summarizing the report. The Task Force delivered an impressive report that goes straight to the core of what is needed to expand career and technical education and prepare students for the 21st century job market. • The School Security Committee released its updated school security report at Workshop.. The committee reviewed NJSBA’s 2014 school security study, What Makes Schools Safe? While the committee found that the report continues to be an excellent resource, it made 15 new recommendations in several areas, including response and recovery, law enforcement in schools, cybersecurity, after-school security, and the use of schools as polling places. • In light of the Parkland school shooting and other incidents, it is critical to look at school safety from the perspective of school climate and early outreach to troubled individuals. As a goal for 2018-2019, an NJSBA task force was established on the Delivery of Mental Health Services. The task force held its first meeting on Oct. 17. In the coming months, it will consult with experts in mental health, counseling, school climate and related areas. The task force will issue its report by June 2019. • School funding continues to be the primary concern among the NJSBA membership – but particularly for the 172 districts that experienced state aid reductions. Three meetings were held in October to give board members and administrators from these districts the opportunity to express their concerns and discuss strategy. The week of Oct. 29, the Department of Education shared the list of districts that applied for emergency funding to alleviate some of the loss of state aid. Of the 47 district that submitted applications, 13 will receive additional funding, totaling $6.8 million. • The Department of Education’s awarding of emergency funds may give NJSBA a window of opportunity to address strategies to mitigate further losses in aid. Delegate Assembly Update: On Nov. 17, the Delegate Assembly will include a special program featuring Senate President Sweeney and former education commissioner Lucille Davy. They will address the report of the Legislature’s Economic & Fiscal Policy Workgroup, which is calling for changes to promote cost-efficiency in government. Some of the recommendations NJSBA supports. Others, such as forced regionalization, raise serious concerns. The Workgroup’s report, called “The Path to Progress,” includes recommendations that NJSBA considers critically important. These recommendations address health benefits reform, special education funding and other areas. Advocacy Update: The Legislature is continuing discussion of bills requiring depression screenings in an effort to control the level of teen suicides. Other issues under consideration are school bus safety; shared services and district consolidation, and certification for mold remediation and removal. $500 million bond question on the November 6 ballot allocates funds for school security, vocational schools and water remediation and infrastructure. Workshop 2018 Update: Workshop 2018 met all of its programming, attendance and financial goals. 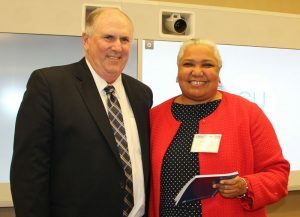 Workshop also provided an opportunity for NJSBA to strengthen its relationships with governmental decision-makers on both sides of the aisle, with the administration and the legislature, and within the education community. Commissioner of Education Lamont Repollet attended the entire Workshop and was the keynote speaker on Wednesday. Information items included legal case summary, NJSBA Delegate Assembly update, and NSBA Delegate Assembly resolutions submitted by NJSBA. Dan Sinclair, NJSBA president, at left in photo, and Elizabeth Martin, of the Hunterdon County Vocational Board of Education. At the Nov. 2 meeting of the NJSBA Board of Directors, Martin was sworn in as a member representing the state’s vocational boards of education.